Made from fallen palm leaves, disposable palm leaf plates are 100% natural and biodegradable, making them a more environmentally friendly alternative to disposable plastic tableware. Besides, they are more solid, easier to recycle, and look wonderful, having a beautiful texture and elegant designs. Because disposable palm leaf plates can be round, square, hexagonal, and other shapes, and are available as bowls as well, they are a great choice for all kinds of events, including parties, weddings, celebrations, barbecues, and long-awaited family reunions. 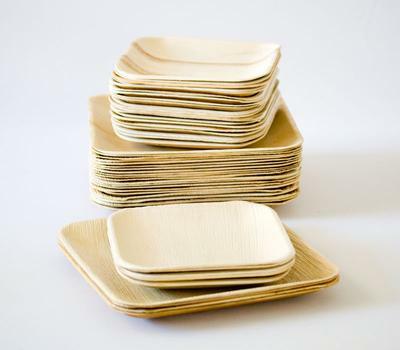 Discover below the full benefits of disposable palm leaf plates. •	Disposable palm leaf plates come from a renewable source. •	The making of disposable palm leaf plates doesn’t aggravate deforestation, nor does it pollute or affect the environment in any other negative way. •	Because they are 100% natural, not containing any glue or glazing, disposable palm leaf plates are 100% biodegradable. •	Disposable palm leaf plates have a unique look, with a beautiful texture and soft colors that catch the eye and that add elegance to any party or wedding table. •	Compared to other types of disposable plates, palm leaf plates are relatively affordable. •	Unless you’ve used them for serving meat, disposable palm leaf plates can be washed and reused. •	Disposable palm leaf plates don’t warp nor can they be easily pierced like plastic plates, making them a stronger, safer, more practical choice for meals that involve many courses. •	Once you’re done with your disposable palm leaf plates, you can toss them into your home compost pile. Environmentally friendly, elegant, and affordable, disposable palm leaf plates are the best solution for your events. By using them, you not only save the planet, but also add elegance to your table, making your event even more special and memorable. If you want to protect the environment, disposable palm leaf plates are your best choice. Comments for Why Disposable Palm leaf Plates and Bowls..?